It has great pedigree, but will this twisted T-type wow us as much as John Page’s three-pickup model? Richard Purvis finds out. There’s more than one famous ‘J Page’ in the guitar business. While Jimmy paved the way for a generation of rock guitarists, John Page has earned a whole lotta love for his luthiery skills. One of the original master builders at the Fender Custom Shop when it started up in 1987, nowadays he’s designing his own instruments – with perhaps more than just a hint of influence from Leo Fender’s classic designs. Page has his own small-scale workshop in Oregon, but the Classic models are a more accessible range with production outsourced to keep the costs within reach of non-castle-owning players. We’re not talking about iPhone levels of ruthless mass production, though – these instruments are crafted in Japan, where the quality of guitar building has been rivalling the Americans for over 30 years. So, back in April we met the Classic Ashburn, a three-pickup solidbody with a few modifications to the S-type formula… and we liked it a lot. The AJ we’re looking at now has much in common with the Ashburn in terms of build, but this is essentially a T-type with a single cutaway, two single coils and a familiar-looking hardtail bridge. The two things that make this definitely not a Telecaster, though, are those Bloodline by John Page pickups, both featuring alnico V magnets. 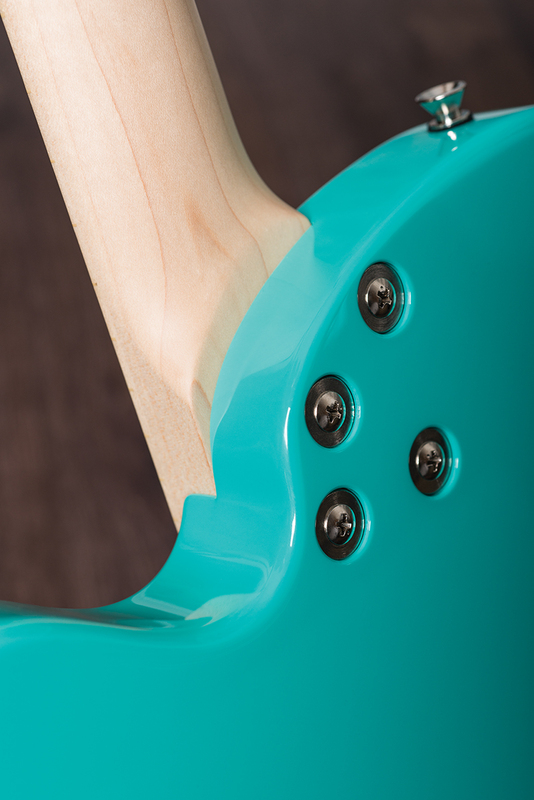 The alder body, maple neck and 25.5-inch scale are all closer to the Fender-invented tradition. That neck is a whopper, a full 23mm deep at the first fret, and this combined with a relatively lightweight body does make the AJ a bit of a drag on the left shoulder. But we like the off-centre fret markers, placed for easy sighting from above – which is, after all, where your eyes normally live. 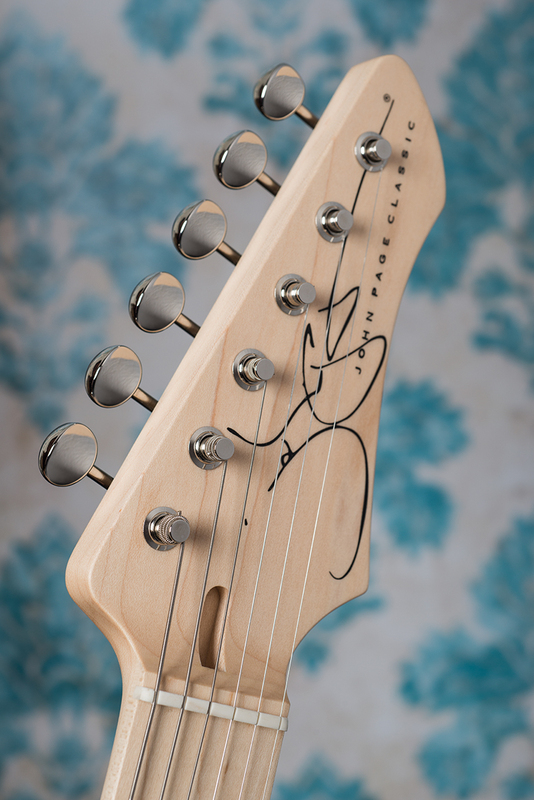 Do we like the headstock, though? Its angular shape is adorned with an outsize signature that’s somewhat less tidy than everything else about this guitar. It could be something of an opinion-splitter.Hardware-wise, it’s all high-quality stuff, put together with classic Japanese precision – from the Gotoh tuners, staggered in height to create solid break angles over the nut without any string trees, to the brass barrel saddles, compensated for accurate intonation. 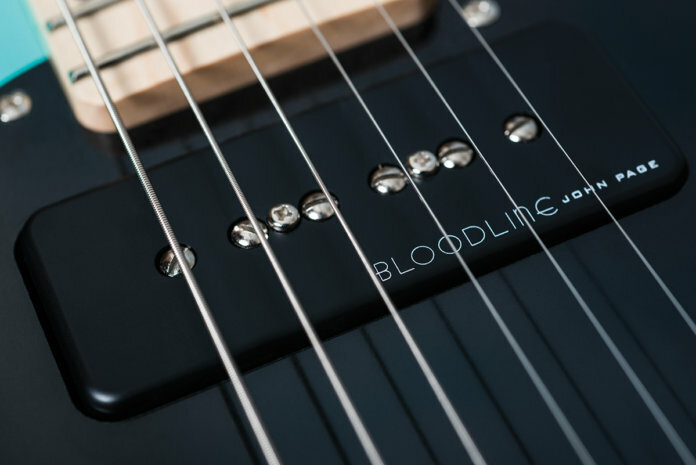 As on the Ashburn, the heel of the body is curved for easier access to the screechy end of the fretboard, and the neck itself has threaded inserts for the four holding screws, ensuring maximum stability and vibration transference. 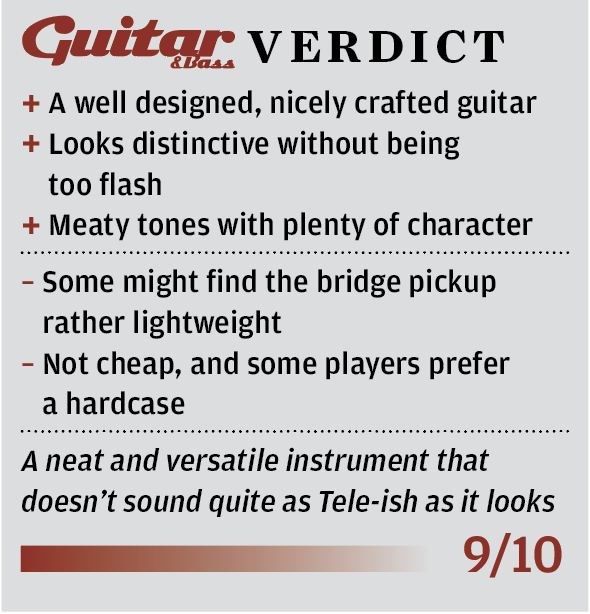 Everything fits perfectly with everything else, no detail seems to have been overlooked – even the slot in the front of the headstock for access to the truss rod is a work of art – and our review guitar plays beautifully right out of the gigbag (yes, a gigbag – you don’t get a hardcase for your grand and a half, which seems a tad stingy but many players find a gigbag more practical). Colour options for this model are fairly limited, but when you can have Seafoam Green, why on earth would you take anything else? It’s a vivid shade that goes beautifully with a maple board but normally suits a white scratchplate; in this case, all the plastic is black, but there’s little enough of it that the overall effect is still likeable. The shape itself is one of the best attempts we’ve seen at the old ‘a bit like a Telecaster but not too much’ conundrum, with Strat-style comfort contouring on both the front and back. Oh, and are you ready for an ‘awww’ moment? It’s called the AJ in honour of Page’s first-born son, Adam John. The usual choice for beefing up the neck pickup of a T-type is a humbucker, but there’s no reason why a P-90 shouldn’t work as well if not better. Page’s take on the classic Gibson single coil proves the point: it’s as beefy as a chargrilled burger and as rich and creamy as barbecue sauce. There’s plenty of snap when you dig in, plenty of smoky character when you don’t, and plenty of fun to be had whizzing up and down the chunky but slickly set-up neck. This is distinctly brighter than a normal P-90, though. Through a Vox-like amp with a Blue speaker, even without the top boost engaged, it’s maybe a touch more zingy than some ears will be happy with. Luckily, the tone control has been judged perfectly to roll off treble in a totally musical way, so softer-edged tones are just a flick of the pinkie away. First impressions of the bridge pickup are even better – and a lot of it is to do with that reversed angle. 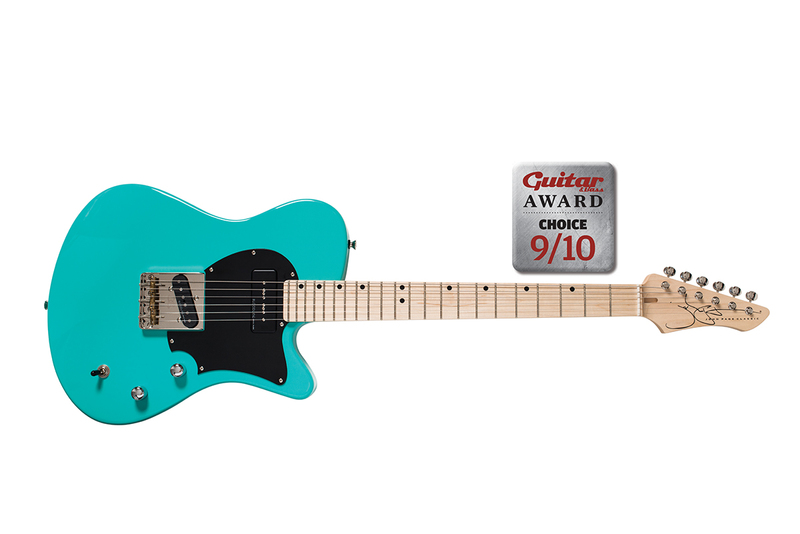 The B and high E strings have more body than you’ll ever get from a normal Tele, but are still bright enough to cut through nicely, while the A and D have more upper-mid presence than usual. It’s an intriguing recipe: less bass in the low strings and less treble in the high ones makes for a more focused overall tone, with the emphasis on rich, vintage twang. The only casualty is the low E, which is thinner-sounding than normal and can almost disappear completely in crunchy chords. This is not a djent guitar. Put those two sounds together and we should be in for something very interesting in the hum-cancelling middle position. In fact, it’s pretty much the best of both, with a load of phasey cluck thrown in as a bonus. In EQ terms, we’re closest to the neck pickup, with no shortage of warmth on the wound strings, but the added twanginess of the bridge pup does a wonderful job of livening up clean chords and arpeggios. 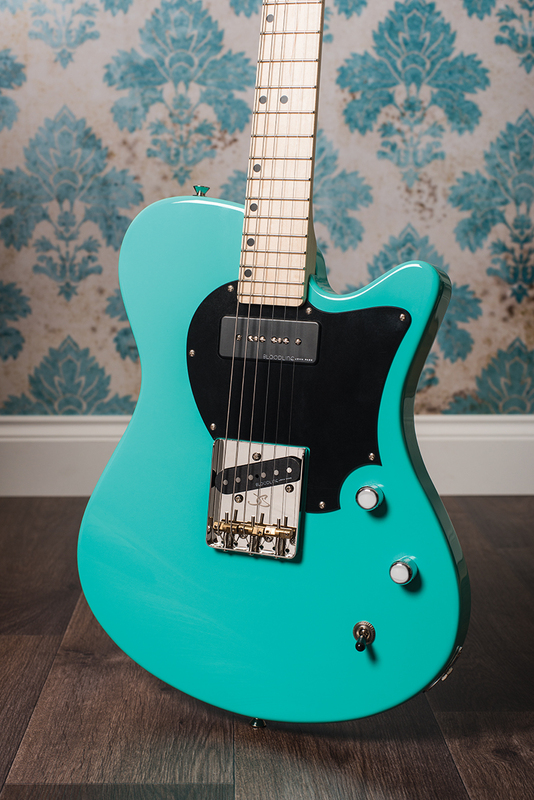 Aptly enough, given the surfy colour, this thing sounds almost more like a Jaguar than a Telecaster now… and that’s a compliment.